For the 6th consecutive year, NJIT’s Steel Bridge Team received first place honors in the Metropolitan Regional Competition. Schiavone has been an integral force behind the team’s achievements and advancement. 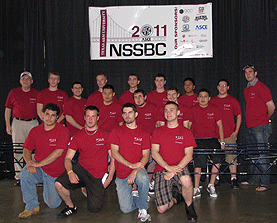 It was six years ago when Schiavone opened the doors of their Fabrication Division to the NJIT Steel Bridge Team and became a major sponsor providing in-kind and financial support for the team. During the months leading up to the competition, the Fabrication Shop become the construction site for the team’s model with many hours devoted to testing, monitoring and perfecting every tiny detail. 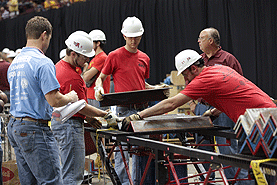 The national competition now in its 19th year, was created to encourage educational excellence among the nation’s top civil engineering programs and to inspire a new generation of engineering leadership.